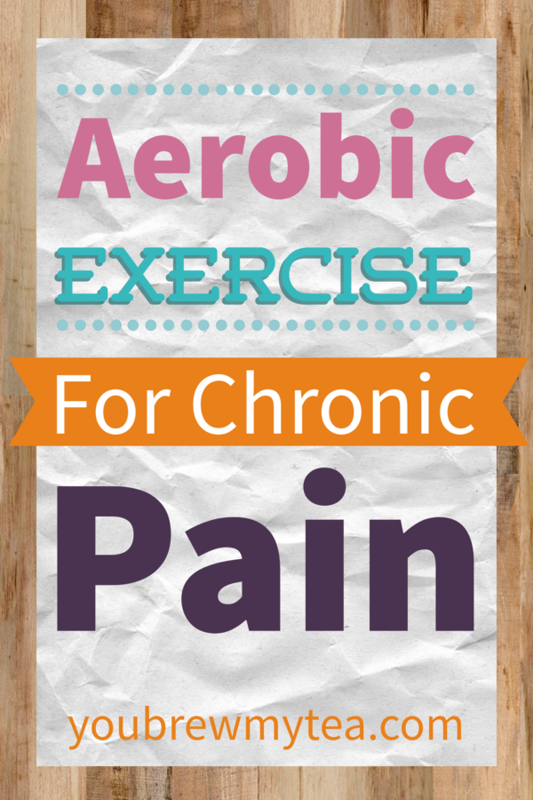 I have discovered there are a number of people out there who need tips on Aerobic Exercise For Chronic Pain. With so many people suffering from things like back pain, Fibromyalgia, Lupus, and arthritis chronic pain is something that is dealt with all the time. Even though I was in pain for two years with a herniated disc, I still wanted to exercise. Sadly, I found many activities just too difficult to do. It wasn’t until I was about to have surgery that I realized how many things I should have been doing. Make an attempt at exercise. It may hurt, but attempting is better than doing nothing. When you have a good day, or a day with minimal pain take advantage of that to get some exercise in. Think about ways you can get your heart rate up. With chronic pain, movement can help ease the pain in some ways, and other times it is simply a means to lose weight which also helps with the pain. Stretch well: Depending on what is causing your pain, you may already be doing stretches. Before you do any exercise you need to stretch a bit to make sure you don’t pull any muscles. Try swimming: Swimming is an excellent low impact workout. Even if you can’t swim, you may be able to walk in laps around the swimming pool. Not only is your body working hard, it isn’t being stressed as much. The water helps your body move easier with less pain. This is actually the only real exercise I currently get. It is low impact, easy on my back and hips, but is making a huge difference in my health. Walk slowly at no incline: Incline and speed are often what hurt when you are walking. The first year I had pain from sciatica (later discovered was a herniated disk), I was able to walk at no incline and a slow pace for a considerable amount of time with minimal to no pain. As my injury worsened, I wasn’t able to do this any longer. Walking is a great way to work out your body with what is aerobic exercise, but minimal impact. Do step exercises. Step exercises were highly popular in the 1990’s and are a great way to work out today. Whether you use steps in your own home, or you have the old school step platform, you can easily step up and down to get your heart rate going. Even slow movement is movement to help your heart rate get up and burn calories as well as move your joints and muscles so they don’t get too sedentary. Don’t push through pain. There is a level of pain that is discomfort, and there is a level of pain that brings tears. It is okay to be a little uncomfortable, but don’t push yourself through pain that is bringing you to tears, making you feel nauseated or making it harder to move. Yes, you need exercise and should challenge yourself, but understand that severe or worsening pain isn’t okay. There are many injuries, like IT Band or kneecap pain that really need attention from a professional to prevent further injury. This, along with many back or neck injuries can become a huge issue if not cared for properly. Seek a personal trainer. If you have tried what you feel is everything and you just don’t know what to do, it’s time to ask the pro. A personal trainer or even a physical therapist can help you to understand different ways to get your body moving without injuring your body worse. Getting the right kind of aerobic exercise for chronic pain does take trial and error. If your body is still unable to do something because of pain, it is time to talk to your doctor about potential help with physical therapy, surgery or different medications. I never want to depend upon medication to get me through the day, and I am sure you don’t either. However, you have to sometimes take the advice of the medical professionals to make yourself more comfortable and able to exercise and help your body to heal and move better and easier. Check out some of our other posts about health and exercise! I started exercising 6 months ago and it’s been amazing! I do a DVD program at home and one of the things they say, “Pain is weakness leaving your body.” If you just exercise every other day and treat it like a positive addition to your lifestyle it’s easier to stick with it. I must admit there are days when I don’t want to do it but I’m always glad after I do. More energy for me helps blossom a positive attitude! Great tips! Creating a regular exercise habit is a big goal for me in 2016. Thanks for sharing with us at the Merry Monday Link Party! Hope to see you again on Sunday night.